A Great 2-Day Whitewater Rafting Trip in Oregon! Our two day overnight rafting trips allow you to see the upper and lower sections of the river with a relaxing overnight camp-out in between the two. The first day is much like our regular full-day rafting trip. But, when you get off the river, we head to one of our beautiful campsites where all you need to do is show up and enjoy the evening. All of your gear will be awaiting your arrival, and tents and camp will be fully assembled when you arrive. We customize each trip for individual needs and desires. This means you can choose a traditional campsite, or one of our more luxurious campsites at Belknap Lodge and Hotsprings, complete with showers, indoor restroom facilities and 102 degree hotspring pools. Once you arrive at camp, sit around the fire and relax, read a book, fly-fish, go for a nature walk or play cards while your guides prepare you a gourmet dinner. The next day, awake to hot tea or coffee and a hearty breakfast. After enjoying your morning meal, we will start a new adventure on the lower section of the river for another day of beautiful scenery and exciting rapids. Don't worry about packing up your tents or breaking down camp, your guides will do this for you. One of the great things about these overnight trips is that you don't have to worry about not having your tent or sleeping gear with you because we can provide all of these things for you. We supply tents, sleeping bags(there is $35 per bag cleaning / sanitizing fee), sleeping pads, chairs, hand-washing station and all the kitchen accessories you will need for a first rate overnight trip. Just let us know when booking your trip what you will need. At the end of the second day, we can either take you back up river to our office at Belknap Lodge so you can soak in the hotsprings ($7.00 per person) and see pictures from your trip, or we can have your car waiting for you right at the take-out. The choice is yours. We are also willing to customize overnight trips to fit your schedule and needs, so call us today with your ideas! Base 2-Day w/Overnight rates $325.00 Adults / $295.00 Kids 12yr and under. 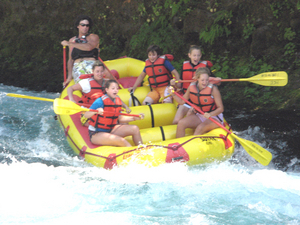 McKenzie River multi day Rafting trips from Belknap Hot Springs near Bend, Eugene Oregon. McKenzie river whitewater rafting trips from half to 2 day rafting trips.